Did you see a facehugger? Which way did he go? The Last Days on Mars isn’t going to last many days in theaters on its limited run, and it certainly won’t linger in your mind. 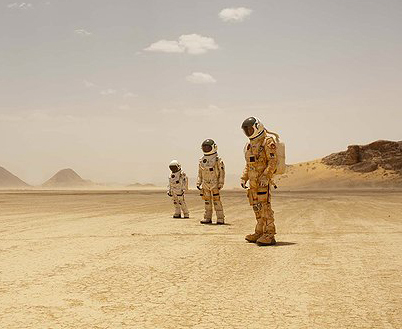 It’s wholly derivative, so stale in its explorations of established sci-fi rhetoric that it only serves to remind us of countless other, better films – Duncan Jones’ Moon, Danny Boyle’s Sunshine, and the speculative Europa Report, just to name a few recent ones. 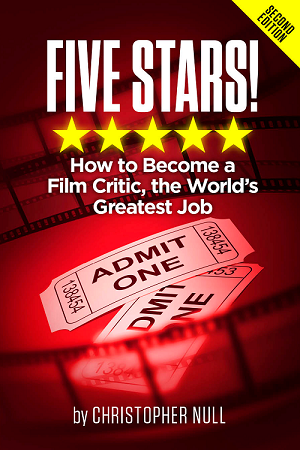 That’s not to say those films are especially groundbreaking, but at the very least they have a clear vision and accomplish what they set out to do. 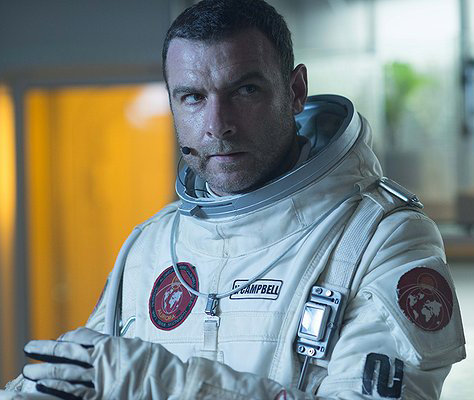 The Last Days on Mars is stuck somewhere between playing it straight and indulging in the ridiculousness of outlandish plot developments – namely astro-zombies that take a shine to using power tools and crowbars as weapons. As the title subtly implies, a research team is nearing the end of their six-month assignment surveying Mars. Their investigations have been frustratingly fruitless, draining any excitement from the first manned mission to the planet. 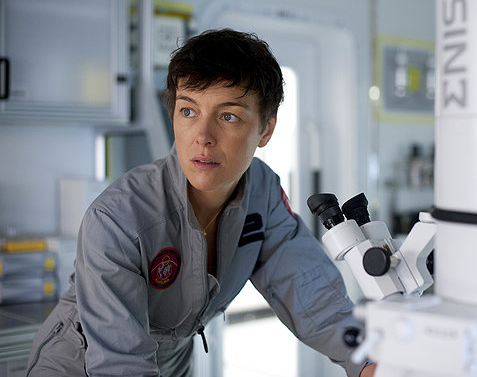 Crew members are cranky and homesick, most of the bickering coming from hard case scientist Kim Aldrich (Olivia Williams). Just before rendezvousing with an orbiting ship for the long ride back to Earth, unintelligible Russian scientist Marko (Goran Kostic) sees something of interest in one of his samples. Not wanting to let the relief crew grab credit for his find, Marko ventures to his dig site where the ground collapses beneath his feet and he vanishes. An annoyed Aldrich discovers that Marko found signs of a microscopic organism as a plan is put together to recover his body. Another of the crew mysteriously disappears, and what was a tense and promising setup quickly devolves into space junk. Turns out this Martian bacterium invades the blood stream and turns the infected into murderous creatures. The rules of infection aren’t made clear, but apparently if you die or are cut (maybe even just touched), you’re doomed. As soon as the first wave of zombified scientists shows up, it becomes clear we’re in countdown mode until a certain number of the crew are infected. There’s certainly nothing wrong with a fun bit of B-movie schlock, but there’s no joy in The Last Days on Mars. Instead, we get a lot of staring, walking, and running, without a lot of building momentum – or sense. It also doesn’t help that the creatures inspire more chuckles than menace when the film is clearly aiming for a sense of dread. 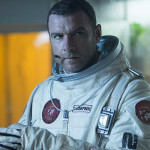 The cast (while human) is fairly strong, with Liev Schreiber leading the way as reluctant hero/engineer Vincent. His low-range monotone voice fits his weary being and also gives the film its one genuine laugh with a line delivered when one of the creatures refuses to stay down. The standout is Williams as the insufferable nut you despise but also don’t mind deferring to for tough decisions in times of crisis. Romola Garai is properly plucky as the cute, quasi-love interest, and Elias Koteas adds a nurturing credibility to his role as mission commander, but unfortunately they aren’t given much to do. Likewise, not much is done with the believable landscape and confining base of operations created by first-time director Ruairi Robinson and his crew. 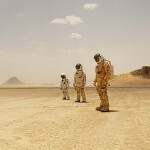 Exteriors were filmed in Jordan, which makes for a suitable double for the rocky, dusty landscape of Mars while the base is full of plausible tech advancements, including iPad-like tablets with innovative, believable displays. Unfortunately, the advanced gadgets are still susceptible to power outages and communication breakdowns when faux tension needs to be built. When everything goes dark, creatures predictably lurk in shadows or behind airlock doors with no inspiration as to how they strike or how the peril in the space narrative plays out… though I have to admit I don’t think I’ve ever seen a zombie attack someone with an electric drill.